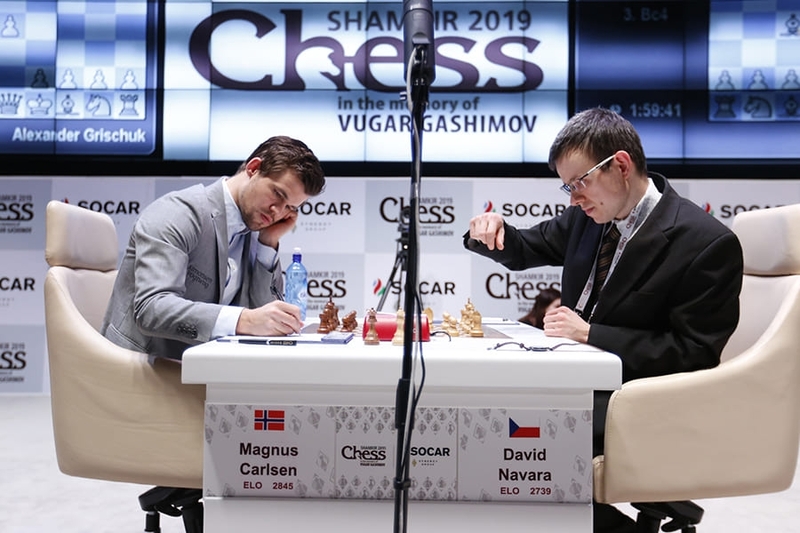 Magnus Carlsen beat David Navara in Round 3 of the Gashimov Memorial to take the sole lead and return to rating heights he last hit before his World Championship match against Sergey Karjakin in 2016. 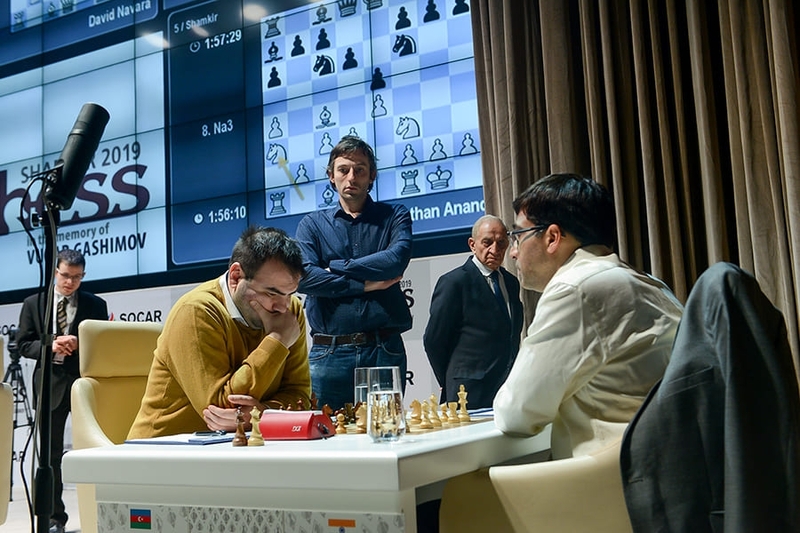 It looked as though things were about to go from bad to worse for Vishy Anand, but in a hopeless position he managed to trick Shakhriyar Mamedyarov, who then blundered again with seconds on his clock and went on to lose the ending. The other three games were drawn, but Grischuk-Giri and Karjakin-Topalov were interesting fights. In this position Fabi played first the rare 12.Bd2, in the game where he had a winning attack if he hadn’t slowed down with 24.h3? at the critical moment, then played the novelty 12.b4 in Game 10, in what would become the most double-edged game of the match. Both players were playing relatively fast, until suddenly David Navara spent 41 minutes on 16.Ra3!? (recalling a 17-minute think from Caruana over the same rook move in London), while Magnus took 32 minutes to reply. It looked like we were in for another fascinating unbalanced struggle, until Navara went for 18.Re3?, only to walk into 18…g5! Navara admitted afterwards that his rook move had simply been a blunder, since 19.Rxe7 runs into 19…gxf4! (not 19…Qxe7? 20.Bxd6! and White is winning), and the rook on e7 finds itself stranded with no safe square to retreat to. He was forced to go for 20.Re6 and play a position an exchange down, later commenting, “It’s technically winning but I tried to put up some resistance”. A computer-powered curiosity, however, is that 19.Rg3! appears to be very close to equality for White. The players, and Arkadij Naiditsch commentating, had dismissed it due to 19…Ne4, but after 20.Be3 or 20.Bd3 White gets much more compensation for the exchange than in the game. Given the World Champion is known for slow starts to tournaments you wouldn’t bet against him climbing still higher. “I’m playing for the only trap,” noted Vishy, and if Shak had spotted it he would probably have played 35…N6h5!, stopping all the fun. Instead he walked into 35…Ne4? 36.Bxe4! dxe4 37.Ne5! Nd3 38.Qh8+! Vishy talked about this queen sac in great length in an interview four years ago, where he mentioned Alekhine missing it against Euwe in 1937, Petrosian playing it against Spassky in 1966 and playing it himself against Leko in 2009. After 38…Kxh8 39.Nxf7+ Kh7 40.Nxd6 Vishy’s problems were over, but the day was about to get better. Mamedyarov, with just a couple of seconds left on his clock, blitzed out almost the worst move in the position: 40…Bd7? That ran into 41.Nxe4!, picking up a pawn. If now 41…Nxb4 you see just why the bishop move was so unfortunate, since 42.Nf6+ forks the bishop and king. In the game Mamedyarov went for 41…Bf5 but after the precise 42.Ng5+! Vishy went on to win the game with little difficulty. Once again the draws were very different. 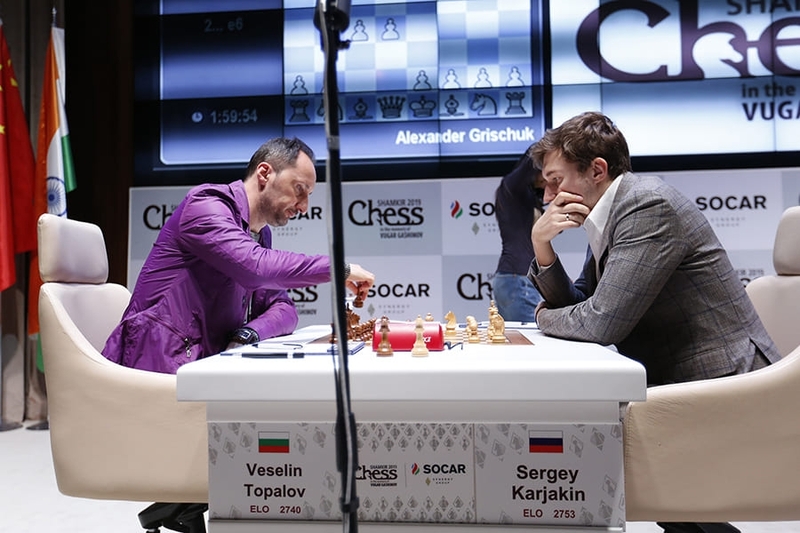 Karjakin-Topalov was a tense and double-edged 4-hour struggle in the Giuoco Piano, but one in which neither side seemed to get a clear advantage before it ended in a 32-move draw. 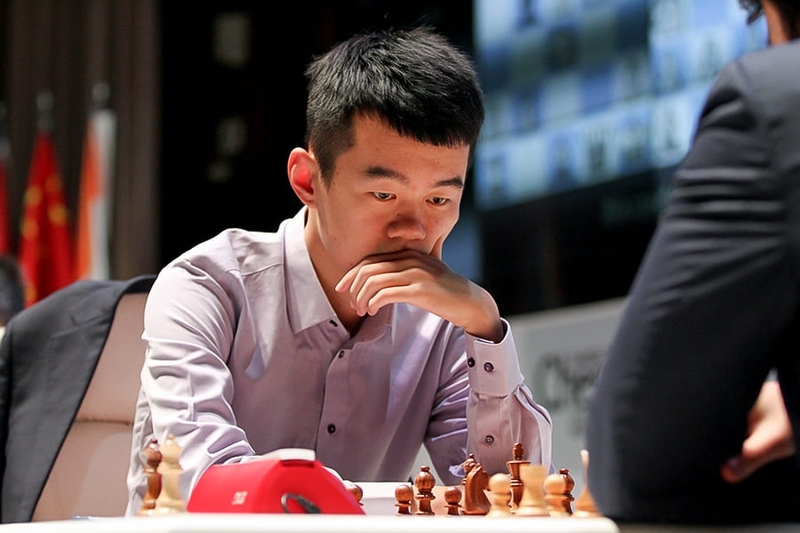 Radjabov-Ding Liren was a Marshall where Teimour Radjabov insisted Black could get into trouble in the ending if he didn’t know exactly what he was doing, but the first 27 moves had been seen in Radjabov-Aronian, Tata Steel 2015 and up to 30…g5 had all been seen in Nakamura-Aronian, Gibraltar 2005. Those games were also drawn, while in Shamkir the players played on until there were bare kings on the board and they each had more than the two hours they began with. 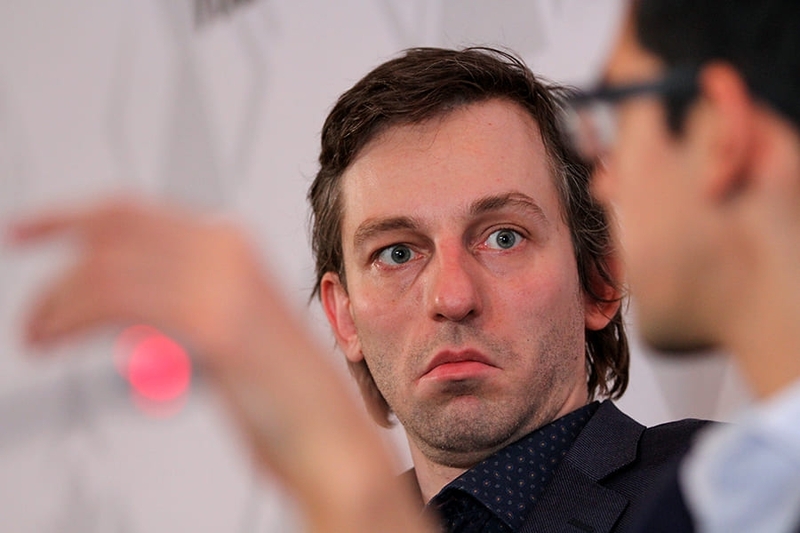 Grischuk said it had somehow escaped him that Black could now give a check not only from a5 but also b5, so that after 17.e4 Qa5+ 18.Kf1 Black has 18…Qb5+ and the players repeated moves with a draw. I can imagine I will have some Twitter or something, but in general I don’t like it. Nowadays, you’re somewhere, immediately someone will make a photo with you, put it on Instagram and everyone knows where you are, what you’re doing. I just absolutely hate it! In general, there are very few things in the modern world I like. Ok, it’s nice we have electronic tickets, to have GPS when you’re travelling, of course there are some very nice things, but in general the way in which the world is going I dislike. So you can say it’s a principle for me, but if you pay me enough I will have another principle! In Round 4 the World Champion has Black against the always uncompromising Topalov, with Mamedyarov-Navara and Ding Liren-Anand among the other games to watch out for. 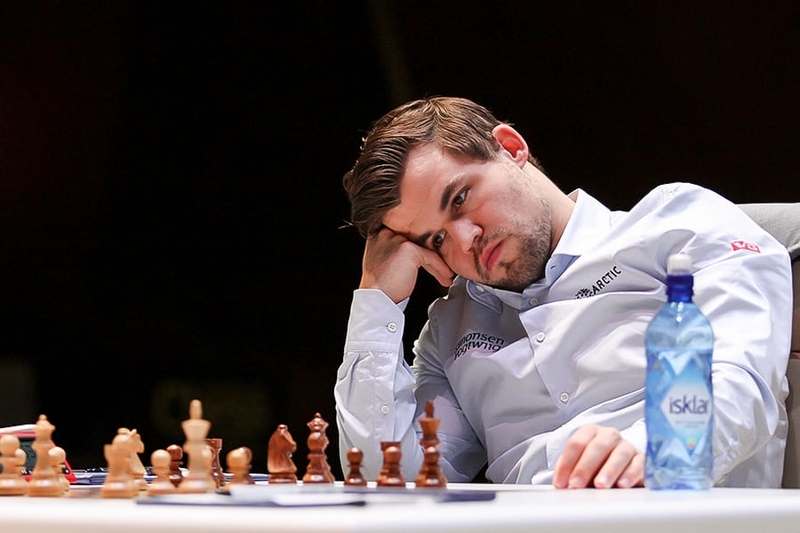 Tune in to all the action from 13:00 CET live here on chess24!